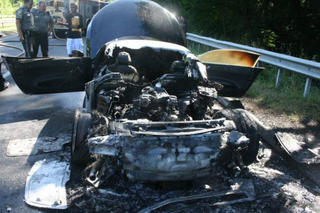 At 9 A.M. yesterday, Powerball winner Rahul Patel watched his brand-new Audi R8 burn to a brucey crisp on Connecticut's Merritt Parkway. Talk about a string of weird luck. According to reports in two local papers, Patel was driving northbound on the Merritt Parkway, between exit 46 and 47, when he saw smoke coming from the car's engine compartment. After pulling over to investigate, Patel reportedly saw flames emanating from the vehicle. The R8, which fire officials have confusingly labeled "a street version of [Audi's] Formula One race car" and one of only two in the United States, was a total loss. Odd Coincidences in Luck Department: On June 29, 2009 — a few weeks shy of a year ago — Patel, then 32 years old, won $25 million off a $1 Powerball lottery ticket. The cause of the fire is still unknown.